It has been a while since I have done any couponing at CVS but I was near by and I wanted to use my $3 free ECBs because I needed more of my Natural Tom’s of Maine toothpaste which is usually $5 a tube so I did a couple of other little deals while I was there. I’ll take it! I needed toothpaste anyway so I love getting it and other items with it for half the price of the toothpaste. Awesome! 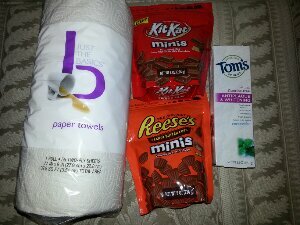 I have been getting better with my couponing and have been using them mostly at CVS. I wanted to get the CVS pull ups deal last week but I missed it. Thanks! I haven’t been doing as much couponing as usual lately because I’ve been so busy but I want to start doing it a lot more often because it saves soooo much money.